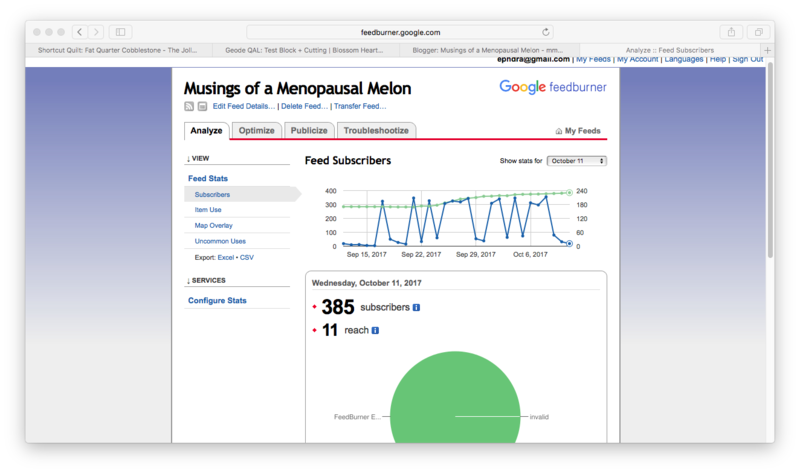 Here are two tutorials; the first is the tutorial for how to find out some stats on your blog. Normally I rarely pay attention to these, but during giveaways, it's nice to determine whether the person picked actually does follow you if they are getting an extra entry for doing so, right? 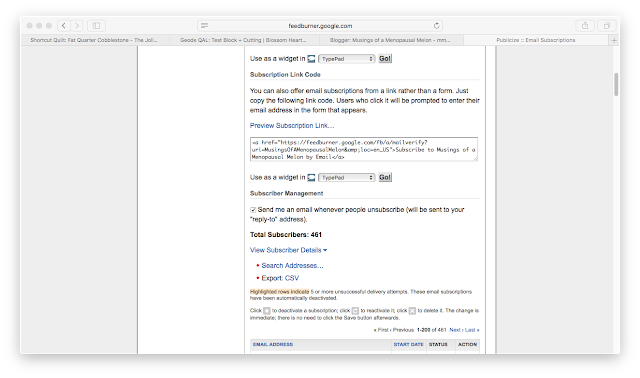 You know how you can subscribe to favourite blogs by email so you never miss a post; well, as a blogger, how do you find that list of subscribers to your blog? I use blogger, so I do not know if this applies to Wordpress or other blog formats. Disclaimer: I am no tech savvy person! All I know is from Googling stuff or trial and error. 2. Click on your blog name. 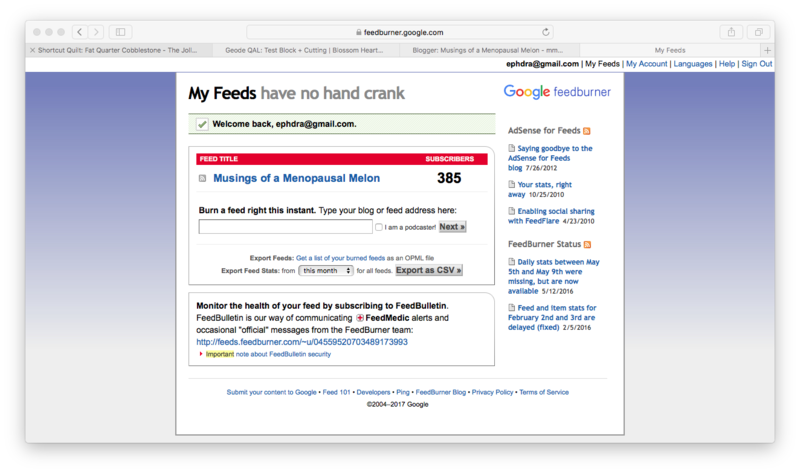 It will take you to the Feed Stats Dashboard where there are four tabs. You will automatically be in the Analyze tab (I love Troubleshootize - they have a bit of a sense of humour no? Look at the phrase after 'My Feeds' in the photo above! Click on the Subscribers tab on the left side of the page. It is pretty easy to scroll through the list to confirm a winner's subscription. You can click 'Email Address' to sort alphabetically, or 'Start Date' to sort by date. A quick Google and yip-yip-yippee I could. Yay! !🎉🎊 Now I don't have to rely on a third party, be at their whim as to them suddenly charging me for their service like picmonkey, or suddenly removing the ability to embed a link on a button I make, like photobucket, grrr. Here is the second tutorial for today's post. 1. Bring up the photo on your phone. Tap 'Edit'. 2. To enhance the photo, tap the wand icon in the top right. It turns golden. 3. Tap the little circle with 3 dots in it, aka apparently a hamburger. Then tap the felt pen 'Markup' icon. 4. To watermark your photo, tap the +. Tap 'Text' where you will get a textbox in which to write. 5. If you want a different font, tap the AA where you can choose, and you can use the slider to resize it. Tapping the black circle (not a good colour on a black background, right) will allow you to choose the font colour. To write in the box, tap it, and tap 'edit' which will have your keyboard pop up. 6. To move the textbox, simply drag it where you want. Note that you need to touch the textbox to get the little side circles or 'handles' to appear if they have disappeared (ask me how I know) so that you can drag it to where you want it. You can crop your photos too, very easily. Tap 'Edit'. 1. Now tap the crop/rotate icon at the bottom beside the word 'Cancel'. You can rotate, yes, but if you 'grab' as in put your finger on, one of the four corner frame thingies (great term, remember I'm no tech guru) you can pull in the corners to crop your photo. You can move the crop area wherever you want it by simply dragging it to the part of the photo you desire to keep. 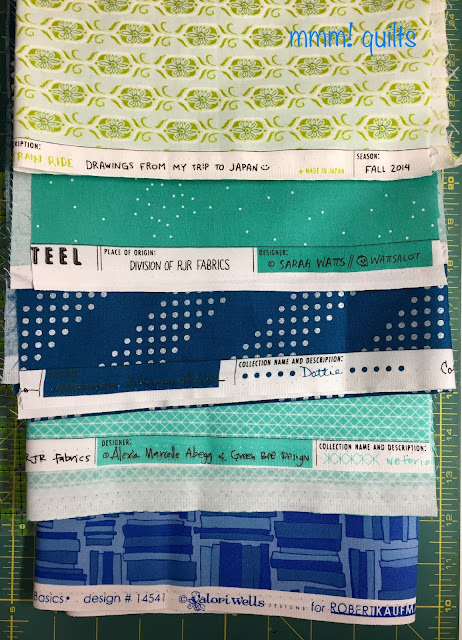 As you can see from the one selvage I was sure to show, these are five pieces from 'Hazel' by Allison Harris. Under $5/yard, yes please and thank you! Here are four pieces of various C&S as well as a Valori Wells, whose fabric I really like, although I don't own very much, hmmm...but this--?! Books! Blue! Into my cart it went in a flash. 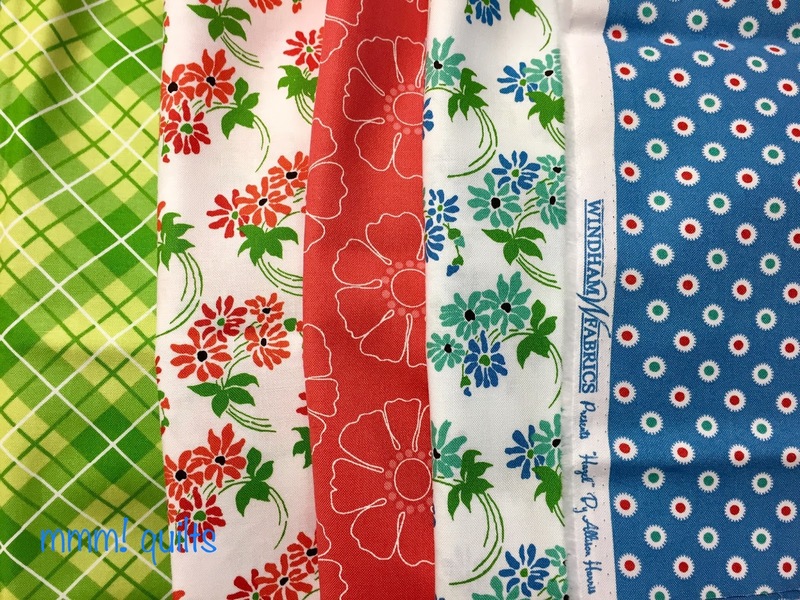 All under $5/yard. Always pays (yourself, right?!) to check the sale or clearance section in quilt shops, be they online or IRL. What I particularly like about Connecting Threads is that they ship to Canada, Australia and the United Kingdom free if you spend $75. That's pretty darn sweet. Bobs your uncle and fannys your aunt with the tech stuff . I had just said to Yvonne in an email I could do with a tutorial in blogger and up popped your post ! I knew connecting threads posted free to Canada but didn't know the uk . Nor did I know how to sign my photos . A great post all round for me ! I still need hand holding I guess, I still can't figure out how to see my followers from bloglovin. I feel as dumb as a box of rocks! Great tips! I had that same reaction when I heard about picmonkey. Thanks for the tech tips! Connecting Threads is pretty much my go to (it's also on my banned list if I'm on a fabric diet. They are like dessert, way too tempting!). Thank you for the tech tips. I’ll have to come back and read this again ..... the photo info sounds particularly useful. Have to see if I can follow your tips. Good tips to follow and use, Sandra! One thing I wish Blogger would have is to tell us WHO unfollows our blog by name. They'll let us know we have an "unfollow", but the name is protected...grrrr. I don't have an iPhone, but I think I can do most of what you wrote about on my Samsung. Thanks so much! Thanks for sharing the tutorial. Will definitely check it out. I was also not happy with picmonkey. I'm temporarily using be funky until I find something else.